Houston is only truly affordable for the low to moderate income earners. Almost 80% of Houston communities are considered affordable in terms of households spending less than 46% of incomes on housing and transportation costs1. However of this group only nine communities make over $50,000 at the household level. These communities are Midtown, Westbury, Downtown, Medical Center Area, Willow Meadows/ Willow Bend, Carverdale, Hidden Valley, South Belt, and Lazy Brook. Households which make more than $50,000 per year do not generally live in affordable communities in Houston. 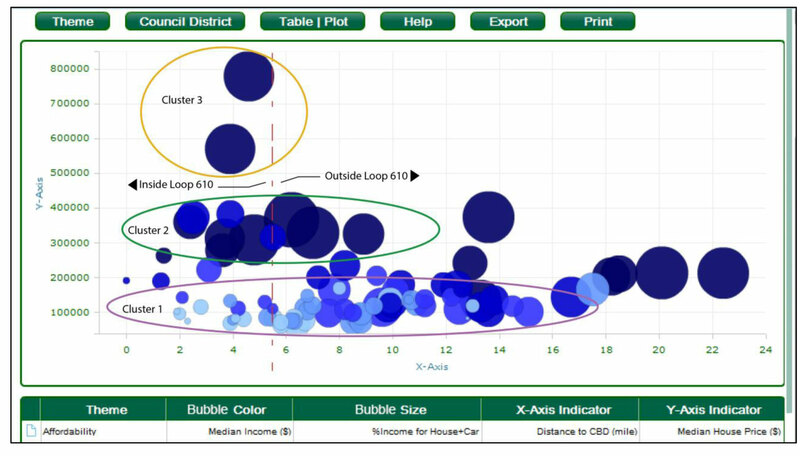 The above bubble chart shows the distribution of communities (Super Neighborhoods) in Houston on an x-axis representing distance from the center of the city; y-axis representing median housing value; color of the bubbles representing median income (darker bubbles are higher income); and size of the bubbles representing percentage of income spent on housing and transportation costs (larger bubbles are higher percentage of income). Some cities have very desirable downtown cores, where the land values are the highest in the entire city for both housing and commercial activity. In these cities the land values tend to gradually decrease as you move away from the center. Median incomes also follow this trend since the less affluent cannot afford to live in the higher priced areas (Alonso, 1964). Houston does not have a single high valued urban core since communities of varying income ranges can be found at various locations from center of the city to 18 miles outside. One contributing factor is that Houston has 17 business centers, therefore prime property is distributed throughout the city making it a polycentric city (King, 2012). The two most affluent communities in Houston, River Oaks and University Place are both approximately 4-5 miles from the center of the city. The median value of homes in these communities are $780,000 and $570,000 respectively (King, 2014). All of the communities within this 4-5 mile distance from the city center (measured on the x-axis) are within the 610 Highway Loop. The chart shows a clear distinction between these groups in terms of income (bubble color); affordability (bubble size); and the median housing prices (measured on the y-axis). There are three distinct clusters of median home values. Cluster 1 is the Under $200,000 group; Cluster 2 is the $200,000 to $400,000 group; and cluster 3 is the $550,000 and above group. The Inner Loop area in Houston is the most clearly fragmented area by income and affordability.There are 29 communities within the Inner Loop of Houston. These communities make up approximately one quarter of the total population. The racial ethnic distribution is very similar to the county level (Harris) with 41% Hispanic, 32% White, 19% Black and 5% Asian2. One solution for a more sustainable Houston can be found by further analysis of Cluster 2. The large size of most of the bubbles in this group, indicate a heavy burden on incomes with regard to housing and transportation expenses. Since the housing market is a relatively free market enterprise, local government can focus on improved transit as a much needed option to reduce the burden of cost of living in the City of Houston. Only 5% of Houstonians use transit to get to work (King, 2013). Since large bubbles can be found outside of the 610 Loop, transit options such as rail, should be evaluated as a complement to the singularly focused bus options for public transit currently in operation. This policy solution may help significantly to reduce the burden of transportation costs in Houston and help Houston households become truly affordable. Houston is only truly affordable for the low to moderate income earners. Households which make more than $50,000 per year do not generally live in affordable communities in Houston. Houston does not have a single high valued urban core since communities of varying income ranges can be found at various locations from center of the city to 18 miles outside. The Inner Loop area in Houston is the most clearly fragmented area by income and affordability. Local government can focus on improved transit as a much needed option to reduce the burden of cost of living in the City of Houston. Interested in learning more about urban sustainability in Houston. Visit the Houston Sustainability Indicators website developed by the Shell Center for Sustainability at Rice University. www.houstoncommunitysustainability.org. Alonso, W., 1964. Location and Land Use. Cambridge: Harvard University Press. King, L., 2012. Houston Sustainability Indicators: A Comprehensive Development Review for Citizens, Analysts and Decision Makers, Houston: Shell Center for Sustainability, Rice University. King, L., 2013. Sustainable development of Houston districts: The health of the City, Houston, TX: Shell Center for Sustainability. King, L., 2014. Houston Community Sustainability: The Quality of Life Atlas, Houston, TX: Shell Center for Sustainabilty, Rice University. 1 Housing affordability is calculated as spending less than 30% income on housing. Transportation affordability is spending less than 15% income on transportation costs. 2 These figures from the 2010 Decennial Census. The City of Houston is 44% Hispanic, 26% White, 23% Black and 5% Asian.